The Jazz2Latin Duo/Band is a completely unique musical experience, perfectly combining both vocally and stylistically a sophisticated mix of Jazz Standards and popular Latin favourites, sung authentically in English and Spanish. Brother and sister José and Ana are both outstanding vocalists whose voices combine perfectly both in duets and in their lush harmonising. They interpret these classic songs with expression and tenderness, José’s brilliant accompaniment on the acoustic guitar complementing perfectly the richness of their vocals, altogether creating a perfect balance of harmony and melody. Reminiscent of the glamour of Hollywood and Cuba in their heyday, this unique duo adds class and sophistication to any function. 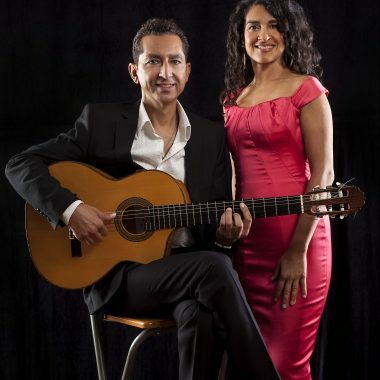 From relaxed melodies to red hot rhythms, with stunning vocals and immaculate presentation, this duo creates an ambience of understated elegance with their incomparable music and song. José and Ana have worked all over the world from Geneva to Dubai and in some of the best Golf Clubs and hotels in the UK including South Lodge Hotel, Saatchi Gallery London, The Royal Academy Of Art, The Dali Museum, Mannings Heath Golf Club, Claridges, Dorchester and Hilton Hotels, London Marriott Hotel Group, Hotel Du Vin, RAC clubs Pall Mall and Woodcote Park among many other fine establishments. Our music is ideal for Weddings, both for ceremonies and during the wedding breakfast, private parties, business and corporate events, Dinner parties and quality restaurants. We are self-contained with a discreet sound system and we take no more than 15 minutes on average to set up. We have public liability Insurance with cover up to £10,000,000 and are both members of the Musician’s Union.